Since I found out that I need to increase my calcium intake, I’ve been looking at ways to eat calcium rich foods. 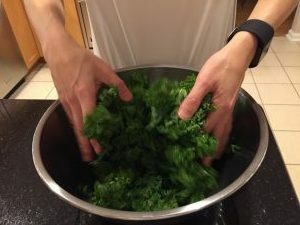 My husband is my home chef and he’s been researching things he can make for me. 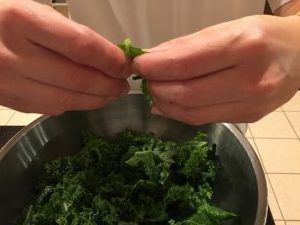 He discovered kale is high in calcium and came up with his own recipe to make kale chips. 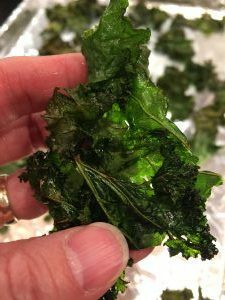 I wanted to share with you his recipe for making Vincent’s Yummy Kale Chips – a recipe in photographs. 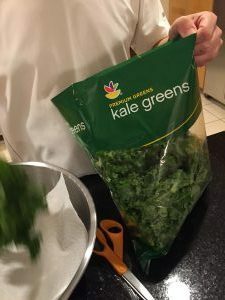 Buy a bag of pre-washed Kale Greens. First pre-heat the oven to 350F degrees. 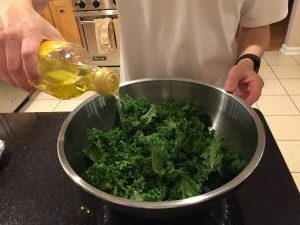 The ingredients are olive oil, garlic powder and fine grain sea salt. Please follow the pictures below, and that’s it! Enjoy! 1. 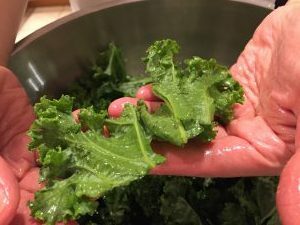 Buy a bag of pre-washed kale greens. This bag is 16 oz., we’ll use half. 2. 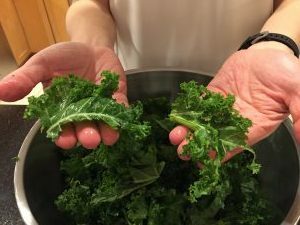 Put the Kale in a bowl lined with a paper towel to dry the kale. 3. 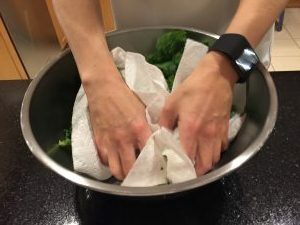 Toss and dry the kale using the paper towels. 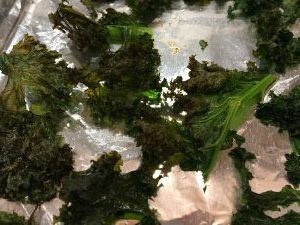 Make sure the kale leaves are really dry. 4. 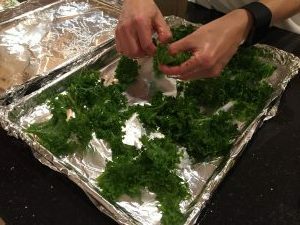 Tear the larger leaves into uniform pieces, taking off the big long stems, where necessary. 5. 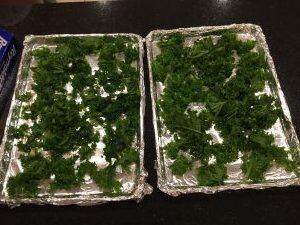 The leaf sizes should look about this size: Size of the leaves are a bit big, but they shrink in the oven. 6. 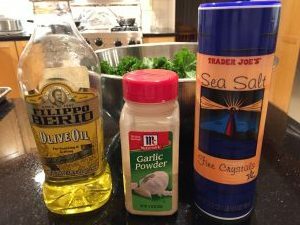 Olive Oil, Garlic Powder (not salt) and fine Sea Salt. 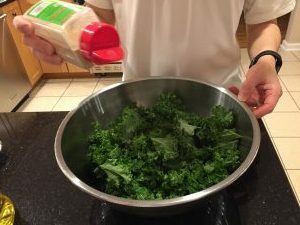 You will drizzle and sprinkle in the ingredients. 8. 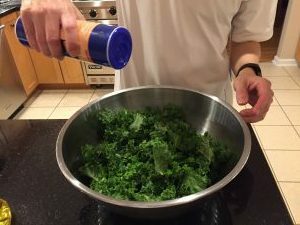 Sprinkle 1 teaspoon of salt (you can add more or less to taste). 9. Sprinkle in 1 teaspoon of garlic powder (not salt!). 10. 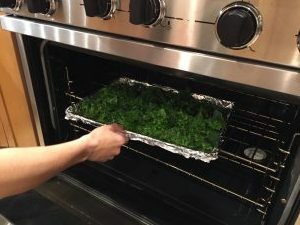 Toss vigorously so all the leaves are coated evenly with the now seasoned oil. 11. 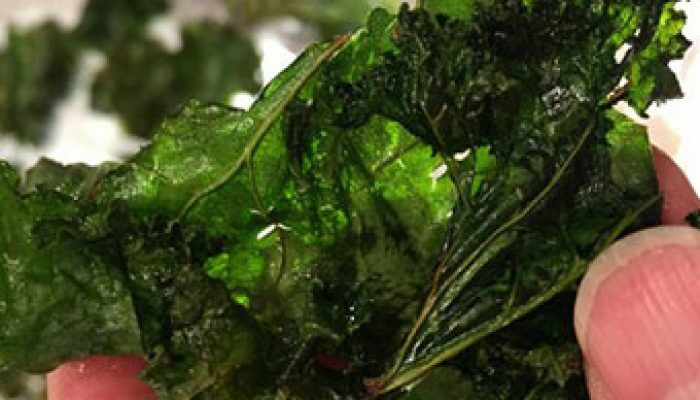 If you look closely, this leaf still has dry spots, you can rub the leaf with your fingers to get oil into the dry spots. 12. Now the leaf is properly coated with oil and is good to go! 13. 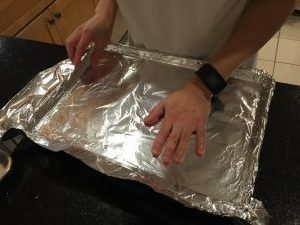 Line two 1/2 sheet baking pans with aluminum foil. 14. 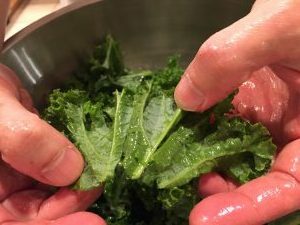 Spread the kale leaves out on the pans as evenly as you can, no overlapping leaves. 15. 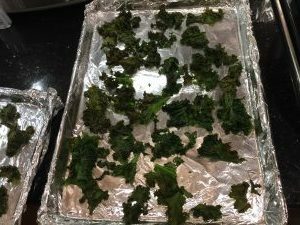 The leaves will shrink in the oven. 16. 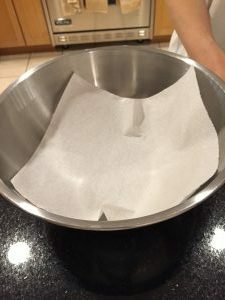 Put both sheets in the oven at 350 F degrees for 13 minutes. 17.AND Voilà!! They’re done. They got smaller…that’s okay. 20. Minutes later…. 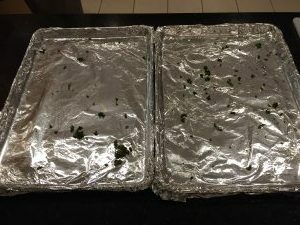 they’re all gone….. so fast… yum!